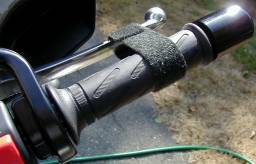 DIY heated grips by Symtec. 25 / 40 watts. $27 from Ca Sport Touring.com. You'll need to decide how to get power to them (see above). Also, where to locate the switch. 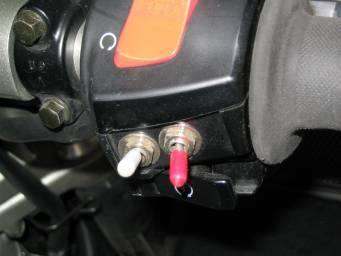 I purchased a mini center off spdt switch from Radio Shack, Cat #275-325,and mounted it in my throttle side switch housing. Here, I have two such switches. The red one is my heated grips. The white one turns off my headlight. 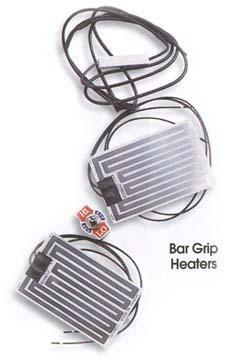 DIYheated grips $27 by Kimpex, ?? watts. Not as good a design as above - low heat works by wasting power in a resistor which has to sit somewhere in your bike and get hot. Also reported to be a bit "flimsy." 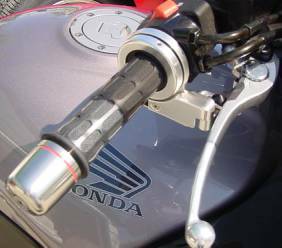 HondaLine heated grips with 4 heating positions. 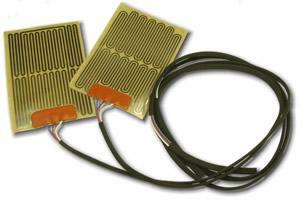 The LCD thermostat control module integrates into the left-hand side fairing panel and provides variable temperature control. Should be available in the US by April. Part number 08T50-MCS-100 + 08A30-MCS-100, $182 + $15 for the accessory wiring harness plus installation. From HondaDirectLine. BMW heated grips are about $225. Keeps your horn from beeping if you bump it into your tank bag. Photo, idea, and machining by Keith Rosendahl. Note the weight-reducing holes. He also has polished his bar end weights. Keith is a very good machinist with entirely too much free time. Using some Velcro One Wrap, tie your front brake lever to the throttle. Idea and photo by Paul Fox. The trick is to polish them to a chrome-like finish. They will darken to what looks like a black chrome if you just leave them alone, or you can polish them a bit on the bike from time to time, or spray a thin coat of clear lacquer on them to keep them shiny. This work should be done wearing a face mask, as I think there's a fair amount of lead in these pieces. At the hardware store, buy about a 5" piece of 1/4" threaded stock, a couple of nuts, and a spacer. Run the threaded stock through a bar end weight, use the spacer on the outside portion, then lock it tight with a nut on each side. Chuck this into a drill press. Use 200 grit or so to cut through the paint, then with scotchbrite pads, blue then grey. 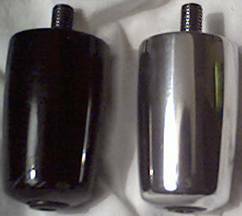 Finish off with a polishing compound like semi-chrome. Lacquer must be put on in several very light coats or it will tend to fish-eye. Idea by Keith Rosendahl, picture by A J Parker. Buy a 1" diameter 3/16" rubber o-ring at your hardware store in the plumbing section. 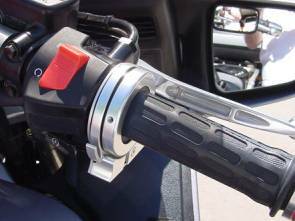 When you want to lock your throttle, put it between your bar end weight and your throttle grip. Otherwise roll it onto the bar end weight. You might need one or two 7/8" diameter 1/8" rubber o-rings also. If you don't have bar end weights, you can use a 1½" o-ring or a loop of clothes line between the throttle grip and the switch housing. 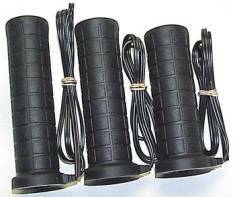 Alternative: buy a large o-ring fromCaterpiller depending on the diameter of your handlebar weights. About $2. The silicone O-ring has better to UV resistance, the nitrile O-ring is a harder material that should wear better. Thanks to R.Cairns of OZ for the detailed info. 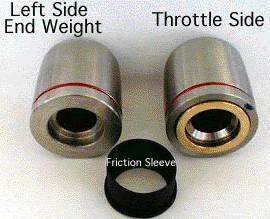 The Brake-Away Throttle Lock $200. 503-516-3154. 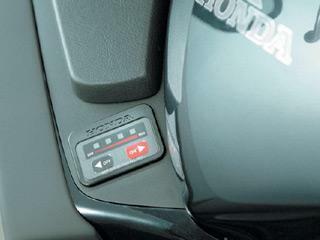 Push button to engage, push button again or touch the front brake lever to release. Pictures by KeithCalhoun. Here, he has both the ThrottleMeister and the BrakeAway installed. Keith preferred the Brakeaway. 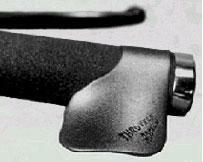 The ThrottleMeister Throttle Lock $130 standard, $147 heavy weight. Turn to engage or to release. 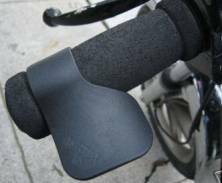 The Throttle Rocker is a $10 molded piece of plastic that fits around your throttle grip, allowing the heel of your hand to operate the throttle without gripping the handlebar. Wrist Rest is a mirror image of the Throttle Rocker. I found this at ebay.com, a pair is $19.